The Golden Dorado River Cruiser is a flyfishing mothership on the Rio Paraná in Argentina. Brainchild of our own Luciano Alba, owner of Estancia Laguna Verde on Jurassic Lake, this project launched in 2015 and has been proving itself to be a worthy concept ever since. 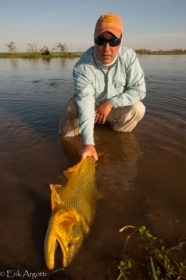 At over fifteen hundred miles in length, the Paraná is a huge river system, the second largest in South America behind only the Amazon itself, and when it comes to chasing the mighty Golden Dorado, what Luciano and the boys realized is that mobility is key. 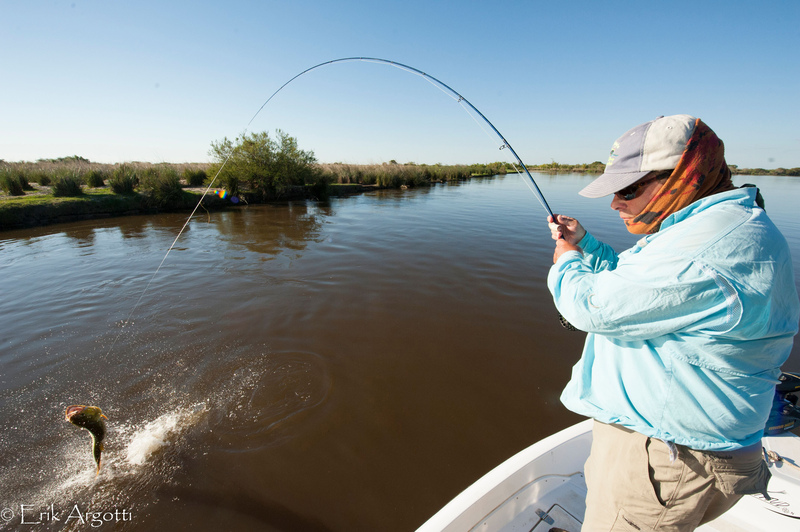 The River Cruiser is a mothership, capable of moving up and down the river to whatever stretch or tributary is currently fishing best along with eight anglers, a chef and full kitchen staff, four guides, and four flyfishing skiffs. For anyone who has never experienced a Golden Dorado on the end of their line, all we can say is, you're in for a serious ride. 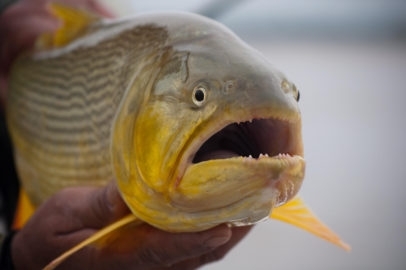 These fish are amazingly strong, insanely acrobatic, and voraciously predatory. And the Rio Paraná is the most important river system they inhabit. But it is an enormous system with hundreds of tributaries, deltas, marshlands, lagoons, and side channels full of fantastic flora and fauna. 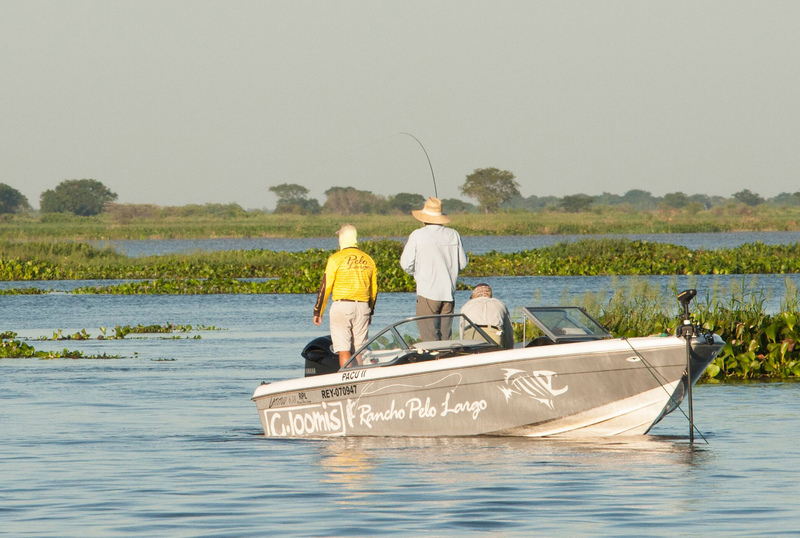 While one part or another of it is pretty much always fishing like a blitzkrieg, the various lodges and guide services stretching from the Brazilian border down to Buenos Aires for the most part have to wait on that blitzkrieg to come to them. Not us! 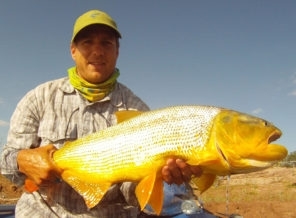 The Golden Dorado River Cruiser was conceived from the beginning to address the question of seasonal and conditional mobility for the entire operation, effectively moving the lodge itself up or down the Paraná River System whenever necessary due to changes in weather, water level, season, bait fish migrations, or simply in response to credible fishing reports. That means that when clients arrive we are already where we need to be, and if where we need to be changes in the middle of a trip then a simple overnight ride wakes clients up in an all new environment for the next day's fishing. The fishing itself is conducted from our skiffs, working new waters each day and throwing big streamers into structures and runs where the Dorado hole up and wait for bait. These are not timid fish, and when they come charging out from those structures and inhale your fly you had better be ready for a battle. Twenty to Forty pound test shock tippet is used and anglers coming from a week with the trout down south will need to re-train their minds and arms to strip set instead of raising the rod when that big colorful streamer disappears. 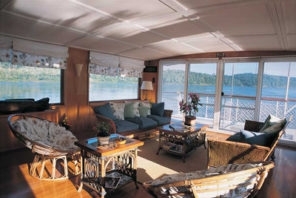 The Golden Dorado River Cruiser is a comfortable two-engine mothership with four spacious air conditioned guest bedrooms, each with its own private bath. 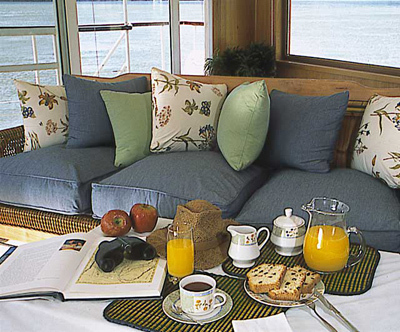 Telephone, internet (weather and location dependent), and satellite television are all available on board as well. A communal dining hall and plenty of open air deck space comfortably set up for cocktails, storytelling, and fly tying provide more than enough room for the entire group. 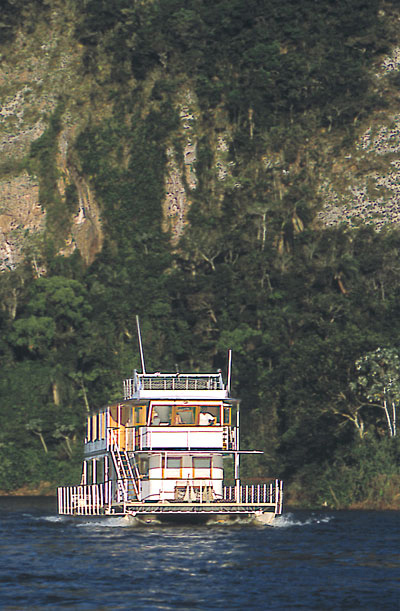 The Golden Dorado River Cruiser is staffed by its own executive chef and service team, providing a diverse blend of local and international cuisine made from fresh ingredients throughout your stay on board. A full bar and excellent selection of fine wines is also available, and guests enjoy the same level of culinary service that they have been accustomed to at our Lago Strobel lodge for many years. Flights for this program should arrive to the city of Buenos Aires (airport code EZE). Programs for the Golden Dorado River Cruiser normally run Saturday to Saturday, but arrangements can be made to accommodate almost any travel schedule. 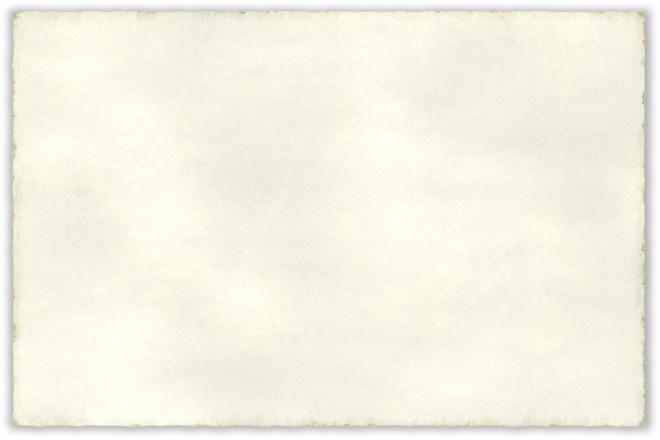 The program is closed from mid-June to mid-August. It is also possible to add more days to these programs, or to create custom schedules. Simply contact us for more information and details. -Round trip Transfers to/from airport to mothership location. 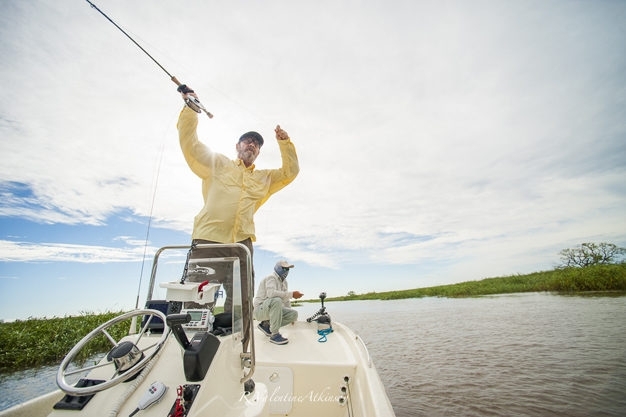 -Fishing at Parana River and its tributaries. 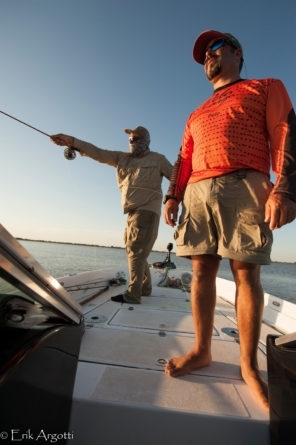 -Use of motor boats and skiffs during fishing, two anglers and one guide per boat. -Lodging at exclusive Golden Dorado River Cruiser, in double rooms with en suite bathrooms. -All meals prepared by our Chef and sous chef. -Full bar including local Argentinean wines, beers, and liquors. -Flights to and from Resistencia or Corrientes. -Satellite and IP Telephone use. -Tips for the staff and fishing guides. 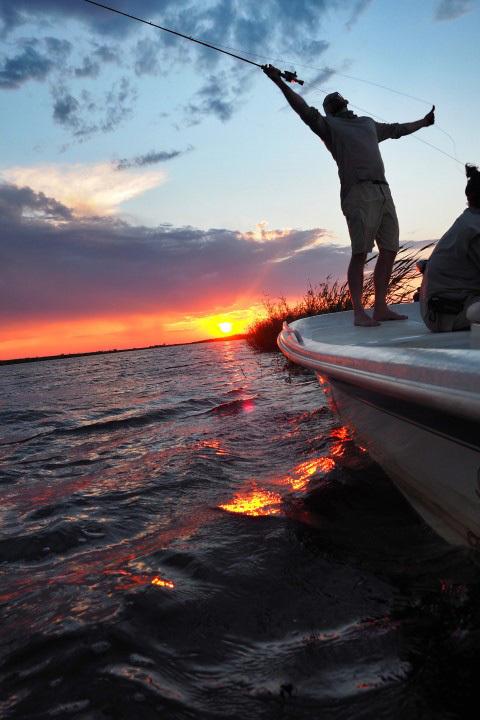 *Custom planned trips are also available for this destination; Contact us today for available dates and details, and get started on your way to this dream-trip of a lifetime to see just why Jurassic Lake has captured the hearts and imaginations of so many fly fishermen from across the globe. 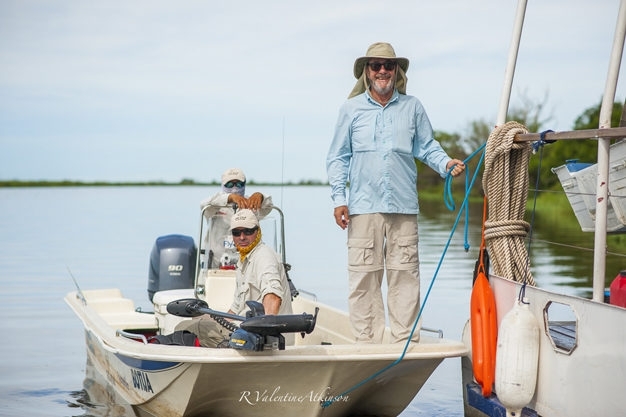 Contact us today for available dates and details, and get started on your way to this dream-trip of a lifetime to see just why the Golden Dorado has captured the hearts and imaginations of so many fly fisherman from across the globe.